﻿Facebook recently surpassed Yahoo to become the second most visited site in the US. According to the article, people also spend more of their attention there and stay on the site longer than Google or Yahoo. Facebook has more than 400 million active users and half of them log in on any given day. It’s clear that Facebook is the king of the social web. Facebook has been around for six years now. And now is the time if you’ve been holding out to start a Facebook page for your library. Or if you have one, to recommit resources and attention to it. We can no longer afford to just “be on the web.” The web has become social, so we need to be social on the web. It reminds me of when the web was new and people were still unsure about getting a web page for their business. This is the same thing. I can guarantee you that if your users are on the web, then a significant portion of them are on Facebook. The barriers to getting a page on Facebook are very low too. It’s not like designing an entire website. Facebook makes it easy for businesses and organizations to be represented and deliver their content to users. It’s also easy to customize your Facebook page. I see it as a more fun, interactive extension of your current website. Patrons are already in Facebook and used to it’s interface, so it could be a great place to get non-users aware of and perhaps using the library. We have a very basic custom tab in Facebook called Research. It allows people to do research in a place they’re already familiar with. 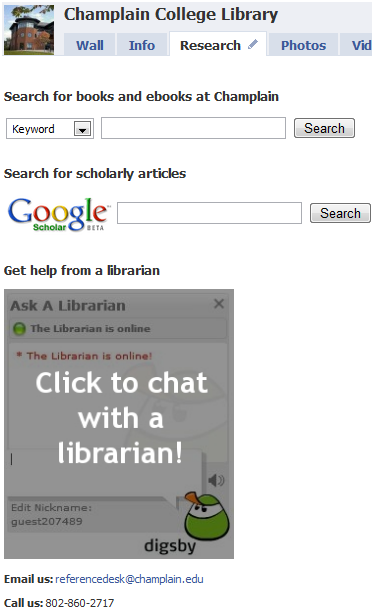 It includes a box to search the catalog, a box for Google Scholar (which we’ve enabled with Library Links), and ways to contact us, most notably by IM. Well, things are getting interesting. Nice post Andy. I've been thinking about a fb page for my library a while now. Thanks for kicking me out of procrastination mode.